Dana Rohrabacher, a pro-marijuana, climate-change-doubting, Libertarian surfer, is no stranger to controversy. Locked in a tough reelection fight, the Orange County Republican, known for close ties to Russia, made news again this week. Rohrabacher, who has served coastal Orange County in Congress for 30 years, was one of the few GOP congressional members to defend President Donald Trump's pro-Russia press conference statements. He also called Monday's indictment of an accused Russian spy whom he met in St. Petersburg in 2015 "bogus." Then there was Rohrabacher's appearance on Sacha Baron Cohen's new satire series. He was one of several congressmen tapped by a disguised Cohen to support a fake program to train kindergartners to use guns. Cohen pitched it as "Kinderguardians." Rohrabacher called the deception "a sick fraud at that, and its intention was to deceive the American people for political purposes." 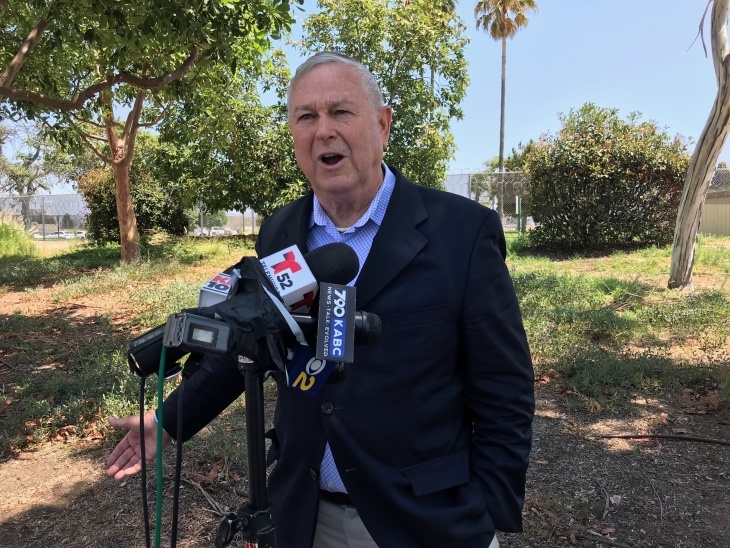 Rohrabacher was in Irvine on Friday touring a U.S. Immigration and Customs Enforcement detention center. He invited local reporters to ask him questions in a parking lot outside of the facility following his tour. Rohrabacher started by slamming the House Democrats who refused to vote Wednesday on a resolution officially supporting the immigration agency. "This is a disgrace. It's an insult to these people that I visited today who are doing such job in trying to protect us and trying to make sure this onslaught of illegal immigration is brought under control," Rohrbacher said. When reporters tried to ask Rohrabacher about the latest news of his connection to the Russia investigation, he loudly shut them down. "You should be ashamed of yourself for bringing that up when we just talked about something really important," he told reporters. Rohrabacher said he had already done "hundreds of interviews on the issue of Russia." After repeated refusals to answer any questions about Russia, and several testy interactions with reporters, the news conference ended. For observers watching closely to see if this once solidly red district flips to blue, the bottom line is: Do any of these negative headlines matter? Or will it just be water off this surfer's back as Rohrabacher heads into, by far, his most difficult election yet? "He has a tough race ahead of him," said Jon Fleischman, an OC-based, Republican political strategist. Rohrabacher's seat is one of two dozen that Democrats must flip in November if they hope to take control of the U.S. House of Representatives, which means his challenger Harley Rouda, a businessman, is getting a lot of support. The 48th Congressional District, a coastal district stretching roughly from Seal Beach to Laguna Niguel, is traditionally a Republican stronghold. But demographic shifts — especially the rise in young, Latino and Asian voters who tend to vote Democratic — is changing the political landscape. More voters in the district cast ballots for Hillary Clinton in 2016 than for Donald Trump. Still, Rohrabacher handily won re-election on the same ballot. That advantage may be fading. A recent poll of voters in the 48th congressional district found Rohrabacher and challenger Rouda in a virtual tie. The poll, carried out by New Jersey's Monmouth University and released Tuesday, also found that one in four Republican voters wish Rohrabacher wasn't their party's candidate. "That tells you a lot about a lack of enthusiasm there among his own base," said poll director Patrick Murray. Lack of enthusiasm, Murray said, could translate into lower Republican turnout in November. What is it going to take for the @GOP to stand up to the Trump agenda? All of us mobilizing together to unseat every single one of them. The incumbent's best path to victory? Fleischman, who backed a Republican challenger in the primary, says Rohrabacher needs to focus on key local issues like immigration and taxes. "The more that Rohrabacher can frame the campaign on the local issues that the voters care about, the better chance he has," he said. "The more it gets nationalized and tied to the stuff that swirls around Donald Trump ... that creates challenges." Fleischman said he's now fully behind Rohrabacher, echoing many of the sentiments of loyalists. "Dana believes in individual liberty and freedom and he's running against Obama junior," Fleischman said, referring to Rouda. "We're talking about two completely different visions of America." The congressman's fans seem unfazed by the periodic firestorms surrounding his words and actions. Asked whether she was concerned about the latest stories about the congressman, Orange County Republican Janine Heft said, "Not at all." "He's true blue. He's an American patriot," said Heft, a Laguna Hills City Council member and friend of Rohrabacher. Heft said she respected Rohrabacher's deep experience and straightforwardness. "What you see is what you get," she said. Michael Schroeder, a spokesman for Rohrabacher's campaign and a former state GOP chairman, said he doubted the congressman's pro-Russia statements would affect his popularity among Republican constituents. "He believes, and I think he's correct, that you can't have a coherent foreign policy ... if you want to ignore Russia," Schroeder said. "The fact that other people want to debate the fine points of that and disagree is not a problem for the campaign." He said Rohrabacher would be focusing his campaign on local and national issues, not foreign policy. These include immigration, repealing the state gas tax and opposing Democrat Nancy Pelosi's attempt to regain her position as speaker of the U.S. House. Paul Mitchell, a bipartisan political consultant, said that given the tight race for the 48th Congressional District and the climate of extreme partisanship, the election could be decided by a small number of undecided voters. That means getting out their core voters will be key for both parties.